Spring might actually start showing us flowering blooms and nice weather. Raise of hands who is ready to get outside and do some Spring shopping?? I am not sure if it is cabin fever, never ending snow or the idea of sporting pastels that have me ready for Spring. Here are some tips that will keep you feeding your shopping itch but save money whilst doing it! 1. 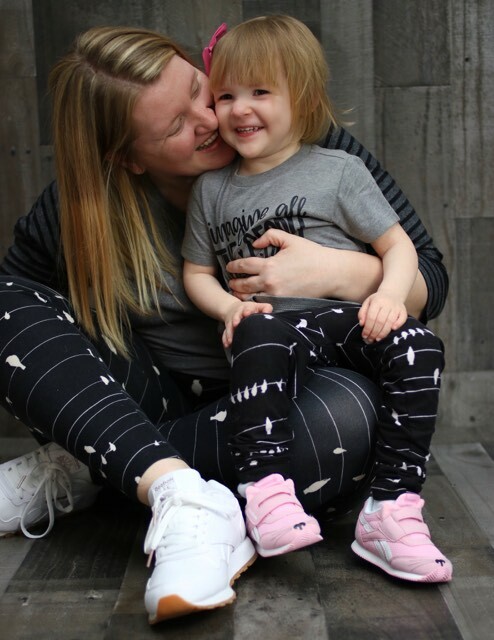 Get on the matching trend with your daughter. Think shoes, leggings, bows, headbands, tops and dresses. The possibilities are endless and might I add super adorable?! 2. 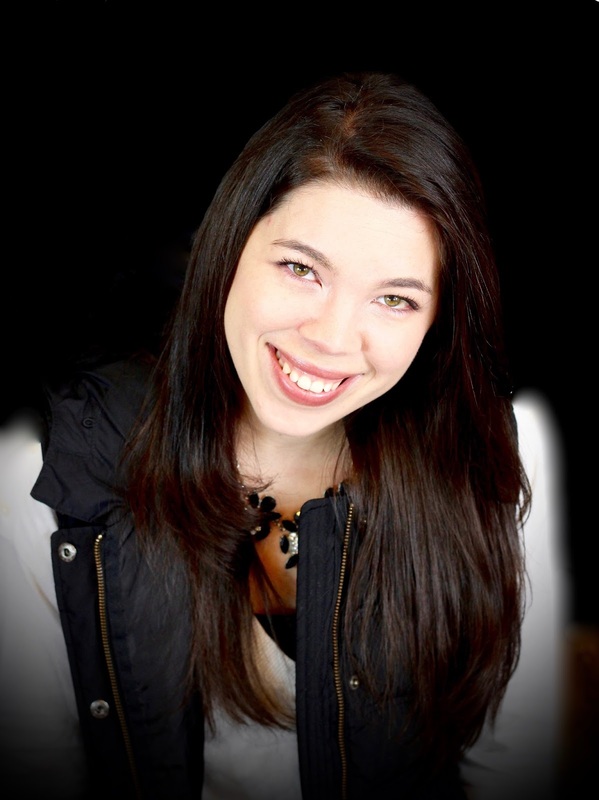 Take advantage of Reward programs! It's usually free to enroll and you can start earning points right away on purchases. For example, if you have the Designer Shoe Warehouse rewards they turn your points into Rewards Certificates! 3. Invest in some new kicks! Instead of spending tons of money in some stores, shop places like Designer Shoe Warehouse. 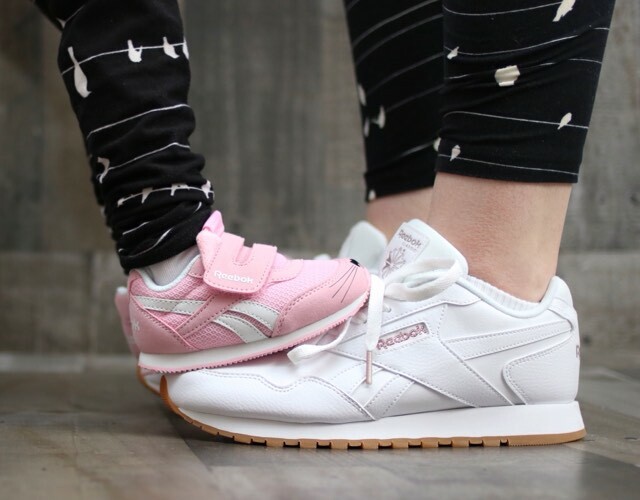 You can find designer kicks like these Reebok Classics (picture above) at a fraction of the price! I can shop for the whole family for the price of one shoes elsewhere. 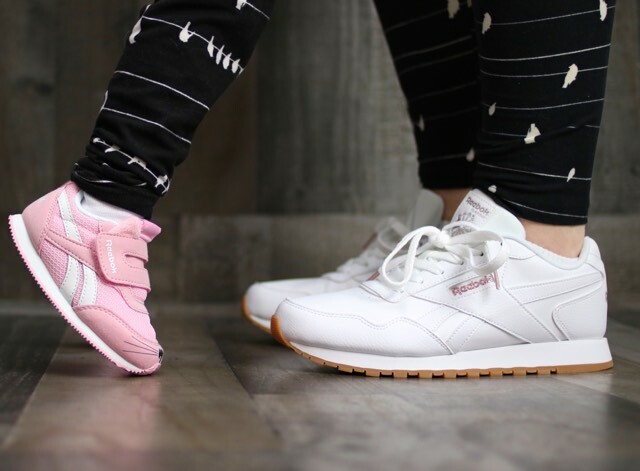 We are really enjoying the Reebok Classic collection. 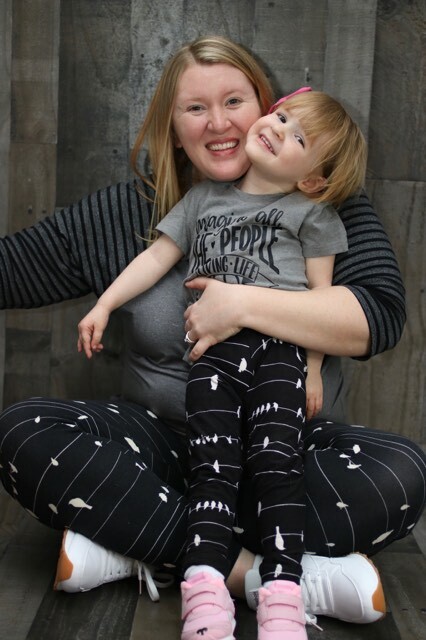 They are comfortable, easy to style and were perfectly priced! 4. I know I suggest this a lot but use promo codes, Casback websites (such as Ebates) and take advantage of FREE shipping! 5. Another great way of scoring some great Spring savings is sign up for places that offer birthday rewards! I am a member of several Reward companies that do this (Starbucks, DSW, Applebee's etc.). 6. Buy colors that are easy to pair with clothes. I find soft tones, whites and black help you pair with more outfits. I tend to wear sneaker daily so if they are these Spring colors I get more wear out of them. I know that sound a bit silly but think about it! 7. When I shop online I sometimes get "click" happy. I order the wrong size! If you shop places that have a easy return policies it can save you time, anxiety and money! Like I always say DO YOUR RESEARCH before purchasing!! I love getting outside to play, walk, hike you name it really! After being cooped up in the house during the winter months we are all a bit stir crazy. 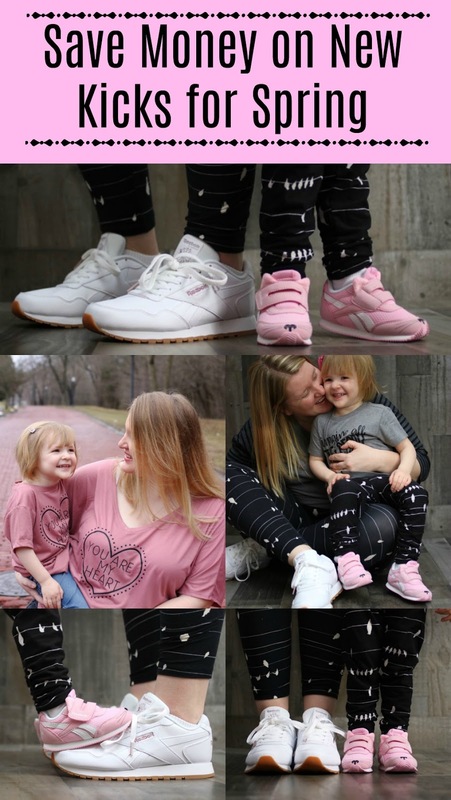 I hope this post encourages you to get out with your daughter in a new pair of kicks for a fraction of the price!! We have so much fun when the weather gets warmer so now is the time to take advantages of the great deals! In just a few short days we will be on Spring Break hiking the Smoky Mountains in our new kicks! Who else enjoys new kicks? Have you ever shopped at Designer Shoe Warehouse? What matching outfits do you wear with your daughter? I used to love doing matching trend with my older daughter. I remember those days. Thanks for sharing this beautiful post. I have that same pair of Reeboks and love them! You guys look awesome in your new kicks. Love those sneakers! 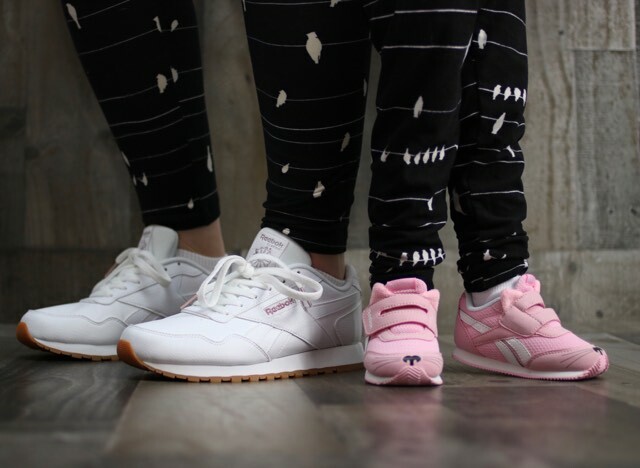 I always have a hard time finding a pair of simple sneakers for my daughter. Everything seems to have glitter and flowers! You guys are adorable! Love the pics and how you match. New shoes are always great, and we love DSW. I am ready to do some spring shopping! I need a new pair of sneakers and have bought some great shoes at DSW. I miss those days! Now, my 18 year old daughter doesn't like matching outfits with me anymore, but always "borrows"/ ""steals" my clothes and shoes. Unfortunately for me , we have the same size. Those shoes are so retro and beautiful. I'd love to buy them for my mum and sister.